Sure, the email subscription preference center may seem like a boring, utilitarian part of your email marketing, but things aren't always what they seem, are they? In reality, the email subscription preference center (phew ... say that five times fast) is actually a fantastic piece of marketing real estate! It allows you to retain subscribers, grow your reach, build brand loyalty, and gather valuable feedback. As a result, customizing the look, feel, and options in your email preference center will allow you to not only meet those utilitarian needs (and CAN-SPAM laws) your subscribers have to manage the emails they receive from you, but also align with your company's branding and style guidelines, and give you new opportunities to grow and nurture your subscriber base. So let's dive into exactly why it's important to customize your email preference center, and the tactics you can employ to achieve each of these various email preference center purposes. Truth be told, now that the HubSpot software supports customized email preference centers, we're still working to better customize our own! No marketer likes losing subscribers. Personally, after checking out my clickthrough and landing page conversion rates, the unsubscribe rate is the next top metric I look at to measure the performance of my email marketing. And while I always want to make it simple and easy for people to unsubscribe from my emails if they no longer want them (I much prefer that over them hitting the "spam" button or ignoring my emails and hurting my deliverability), I would love a way to retain some of those subscribers. 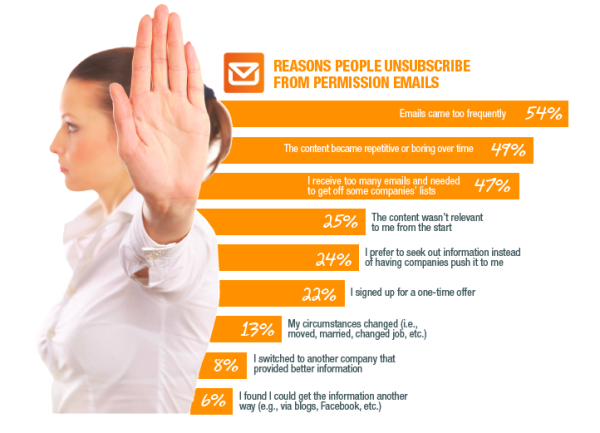 ExactTarget's "The Social Break-Up" report found that the top reasons people unsubscribe from emails are frequency, interest, and volume. So why not let your subscribers control those factors? Having control over the emails they receive makes a big difference in retaining your subscribers over time, because they feel like they're constantly choosing to receive those emails. In addition, giving subscribers this control makes it so that your subscribers are actually improving the relevancy of your emails for you. Relevancy is one of the top reasons people subscribe and stay subscribed to emails, and allowing subscribers to specify their personal email preferences is one of the top tactics for improving relevancy. Another key factor in retaining subscribers is simply giving them a reason to stay -- whether that's reminding them of the value of your content, or simply humanizing you as the sender and why you wanted to share that content. Keep this in mind as your customizing your email preference center. Let them control the frequency of the emails they receive. Let them control which topics they receive emails about. Create multiple, targeted email subscription types, and let subscribers pick and choose among their options. Describe each email subscription option, including the value of the content and the frequency to expect. Remind them why they're getting your emails. Share why you thought they'd enjoy your content/remind them of the email's value. Ask them to confirm they no longer want your emails in a light or humorous way. Give them an option to re-subscribe to other email lists. While someone may not want to receive your emails, that doesn't mean they don't want to receive your content altogether. Maybe they simply get so much email that yours gets lost in the shuffle. Or perhaps they spend more time in social media than in their inbox. Or maybe they just don't like the format of the content sent by email. Or -- at the other end of the spectrum -- it's possible they do want your emails, but they also want to get your content every which way. Why not give them that option? Your existing subscriber base is a great place to start growing your reach across other channels, and gaining a subscriber in social media is often longer-lasting because it's not tied to that person's current job. In other words, you don't have to worry about the same 25% per year expiration that happens with your direct email list. Encourage people to subscribe to your blog. Link to your social media accounts and encourage subscribers to follow you there. Explain what content to expect in other channels, including topic, frequency, and format. Provide a sample of recent blog articles to encourage people to click through and subscribe. Include one of your top videos to showcase a different type of content you offer. It's not often that we talk about branding in our HubSpot content, because we're very data-driven, and it's hard to measure the direct impact of great branding. But we do often talk about being more lovable in your marketing, which is not only part of our inbound marketing philosophy, but also generates higher conversion rates and better subscriber and customer retention because it's centered around customers' needs. You might think it's weird to talk about brand loyalty in regard to a page people visit to stop receiving communications from you, but this is actually a great opportunity to influence how people feel about your company, even if they do choose to unsubscribe. In this very moment where you've captured a subscriber's attention, you have the opportunity to make them smile, highlight how great your company is, and leave them feeling good about your company so that in the future, if anything changes, perhaps they'll come back to you! 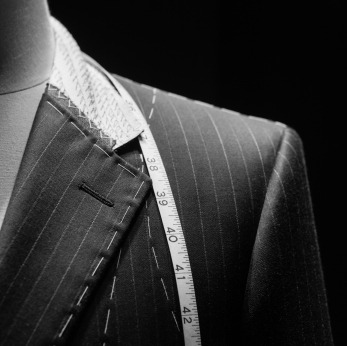 Match the look and feel to your website and emails so people know they're in the right place. Incorporate language that aligns with the primary language of your subscribers. Include a funny video to make them smile and to humanize your brand. Make it extremely EASY. There's nothing I hate more than getting confused about how to unsubscribe when I already don't want to deal with a company's communications. Give a free goodbye gift such as a form-free offer or a discount code as a final thank you ... and a pleasant surprise. As a bonus, doing fun things to be more lovable and build brand loyalty, like in the following example, can also get people talking about you in a positive way. 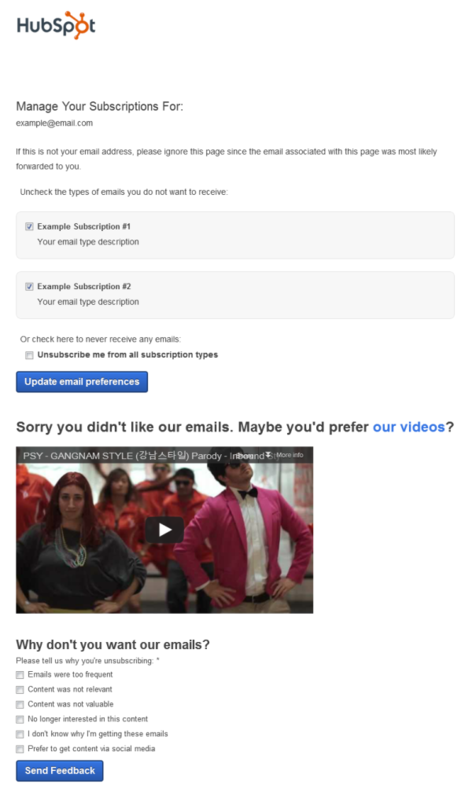 Groupon's unsubscribe page, which features its "Punish Derrick" video, is one of the most cited examples. Its page features a video of someone throwing hot coffee on Derrick, "the guy that thought you'd enjoy receiving the Daily Groupon email." User-generated videos of Groupon's unsubscribe page have been viewed thousands of times -- I found at least two videos, one of which had 1,500+ views, and another of which had 7,200+ views -- which don't even account for the views of Groupon's original video on its unsubscribe page! Our final email preference center customization reason is a more inward-facing benefit for you, as the manager of your company's email marketing: collecting feedback on why people are unsubscribing. This feedback helps you figure out how to improve your email program by understanding if you should change your content, frequency, targeting, or anything else. Include an optional feedback survey to ask why people are unsubscribing. Allow people who unsubscribe to leave their own, open-ended feedback. Give people the option to contact you directly. You'd be amazed by the kind and useful feedback you can get through direct communication. Above all else, the most important thing you can do to your email preference center is make it SIMPLE. This is one of my personal pet peeves, but then again, who doesn't hate receiving yet another unwanted email, finally deciding to seek out the unsubscribe link, finding it hidden in white text on a white background, clicking through to a confusing page with lots of boxes and buttons and distracting images, having to enter your email address again, and clicking the "update preferences" button only to get a weird error? Don't beat around the bush. Making it difficult to unsubscribe may seem like a genius way to retain subscribers, but in reality, do you really want those people to stay subscribed to your email so they can keep hitting the spam button or constantly delete your emails? Furthermore, making it difficult will only serve to frustrate people even more, leaving them with a negative view of your brand that they might potentially spread to others via word of mouth. Don't send your unsubscribes off on a sour note. Make it easy for subscribers to find the unsubscribe link in the emails you send. Make it obvious what the subscriber needs to do in order unsubscribe. Include the option to unsubscribe from all email communications at once (or else violate the CAN-SPAM Act). Clearly show contacts what they're already subscribed to. Provide a clear confirmation message that their preferences were updated. Remove any extra distractions such as navigation, images, competing text, etc. Allow people to unsubscribe without having to do anything else, like entering email address again, completing a feedback survey, etc.